Farzeen Firoozi, MD is the Director of Female Pelvic Health and Reconstructive Surgery at the Smith Institute for Urology, at the North Shore-LIJ Health System. Dr. Firoozi is an expert in laparoscopic and robotic surgery for pelvic floor reconstruction. His clinical interests include urinary incontinence, pelvic organ prolapse, complex reconstruction of the lower urinary tract, and management of complications of vaginal and lower urinary tract surgery. 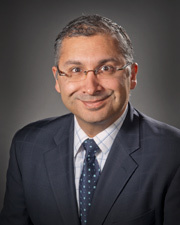 After completing his urology residency at Albany Medical Center, Dr. Firoozi completed his fellowship at the prestigious Cleveland Clinic, with specialization in male and female voiding dysfunction, pelvic organ prolapse, incontinence, overactive bladder and neuro-urology -- one of few fellowships formally recognized by both the American Board of Urology and American Board of Obstetrics and Gynecology. Dr. Firoozi has pioneered, innovated and published new methods for the treatment of combined pelvic organ prolapse. In addition to performing the first ever reported transvesical Laparoendoscopic Single Site Surgery (LESS) for the management of vaginal mesh complications, Dr. Firoozi gained extensive experience with robotic and laparoscopic reconstructive surgery while at the Cleveland Clinic. Dr. Firoozi's research interests include stem cell research for urinary incontinence. He has been awarded multiple grants to pursue this work. Dr. Firoozi has presented at numerous national and international meetings, and won multiple awards for his work. He is an active member of the American Urological Association, International Urogynecology Association, and the Society for Urodynamics and Female Urology. He has been published in leading national and international journals including The Journal of Urology, Urology, The British Journal of Urology, Urologic Clinics of North America, European Urology, and the International Urogynecology Journal. Dr. Firoozi has also written many book chapters for some of the leading editors in his field. Dr. Firoozi has recently published his first textbook, Female Pelvic Surgery. He is currently working on a second textbook in the field of Female Pelvic Medicine and Reconstructive Surgery. Dr. Firoozi has been named a Rising Star Superdoctor in the New York Times Magazine in 2013 and 2014, and names Superdoctor in 2015. Dr. Firoozi is one of very few physicians with accredited, formal fellowship training in the field of Female Pelvic Medicine and Reconstructive Surgery in Long Island and the New York Metro Area. He was also part of the first group of surgeons to become certified in the subspecialty field of Female Pelvic Medicine and Reconstructive Surgery. In addition to practicing and advancing his specialty through innovation and education, Dr. Firoozi places compassion for his patients and their needs at the top of his priority list. "He is an amazing MD!! Very professional and caring & helpful!! I love that guy!!! He's 100% ++. " "Dr. Firoozi is great. Very personable & very friendly & definitely concerned about your issues. " "Very nice practice, was one of the best I've been to." "Doc Firoozi was the best doctor I have ever seen. He was excellent in every one of these one thru ten questions. " "Dr. Firoozi is amazing. that's the reason I deal with the nonsense and drive so far - to see him, he is worth it all. not only a medical expert; a decent human being. in other words, professional." "Dr. Firoozi is wonderful. He is caring & compassionate." "Doctor discussed multiple available treatment options with me. took time to answer my questions. Treated me as a unique individual with unique medical problems. Went above & beyond expectations." "I would suggest that information on medications prescribed be given in writing - seems that patient and person accompanying patient understood different things. Info on medication and whether or not it is ok to stop it and possible side effects might best be given as a printout to review at home." "He was kind and explained things to me. I appreciate him calling me back to give me clarification." "Dr. was very professional and explained everything I am very happy he will help me out and as the surgery by himself. " "Dr. Firoozi is simply the best!" "Very happy with Dr. Firoozi - new approach in treatment working so far. I am very happy. " "Excellent - The behavior & sympathetic attitude of Dr. Firoozi is wonderful & excellent." "Admire my doctors professionalism, assertiveness and open mind. Shows empathy for all I share about my medical history." "First time seeing this doctor I don't know how future visits will be. Very good for now." "Dr. Firoozi is great. He lets you know that he cares." "I consider Dr. Farzeen Firuezi as an outstanding urologist and is an asset _____ Health." "Dr. Firoozi is outstanding - smart, caring, & helpful." "The dr. is amazing - I will sing his praises to everyone -"
"Good ex. #1. Dr. Firoozi, F."
"The dr. seems so caring and gentle & personality it was very calming visit." "Dr. Firoozi is a kind, caring doctor!" "Care team is highly professional and available to answer questions." "Explanations & familiarity w. my record _____ to get me in for MRI & visit due to surgery - I really appreciate that." "Dr. Firoozi is a great doctor." "I already recommended Dr. Firoozi to my Son."